One "dual purpose" electronic device enables experiments on animals involving parasites, bacteria, and viruses, including AIDS, Anthrax, Bubonic Plague, Cancers, E-bola, Fungi, HIV, Small Pox, Typhoid Fever, etc., and many other diseases. Also, colloidal silver can be made in high or low concentations for alternative experiments. 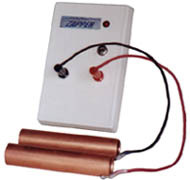 The veterinary Zapper/Colloidal Silver Generator can be used in the field with external power options, including a small solar module. No published data on animal fetal safety or animals fitted with low power electric or electronic devices is available; therefore, parasite elimination experiments on pregnant animals or animals fitted with devices such as pacemakers should not be done in the ZAPPER mode. Colloidal silver has been used by humans to fight about 679 known pathogens and parasite conditions since pre-1938 with no toxicity and without any reported cases of agryria with silver that remains in colloidal suspension. Notwithstanding the above, this device is for experiments with experimental animals.